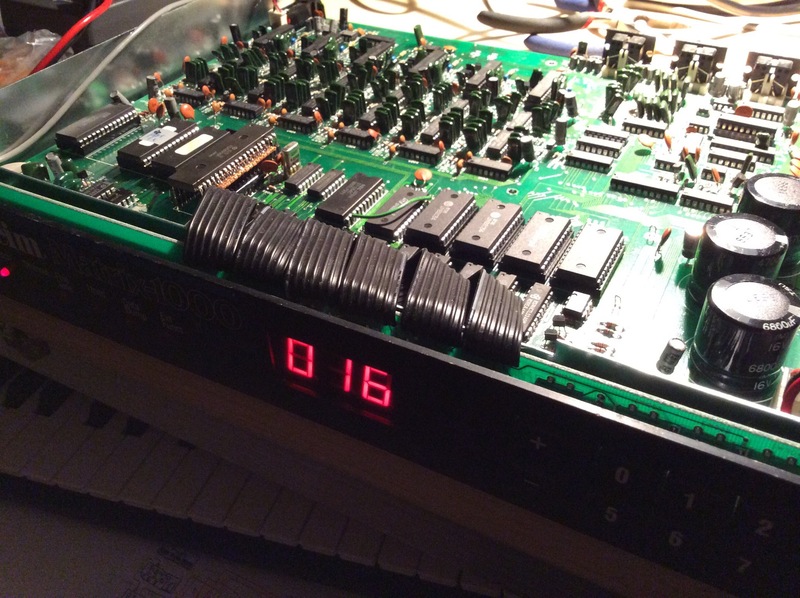 Bob Grieb’s brilliant firmware rewrite for the Matrix-6 and Matrix-1000 machines has been in testing for some time. 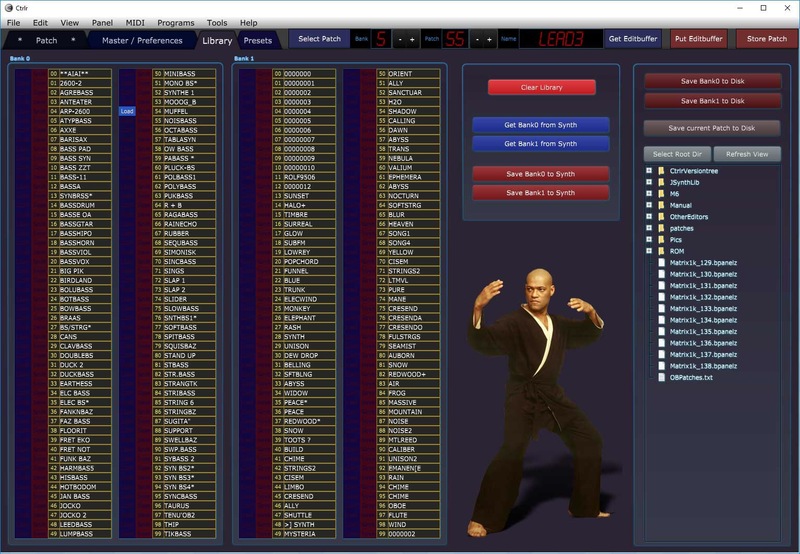 The code seems to be running fine and is definitely a huge improvement: Matrix-6 owners will gain a machine that is much more responsive, and has been ridded of a couple of nasty bugs. And even for Matrix-1000 owners that have been using GliGli’s v1.16 patches, the new software offers, in my humble and slightly biased opinion, great advantages. Bob has started shipping EPROM chips containing the new code to people who do not have an EPROMMER available, and I’ve agreed to doing the same thing over in Europe. The price for the update is €25 plus shipping,this contains a payment to Bob as a recognition of the endless hours he spent in analysing and rewriting the code. 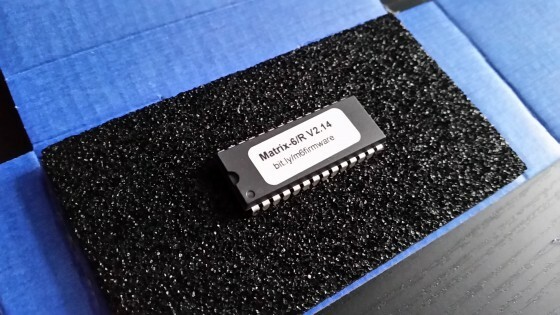 You can find a first batch of Matrix-1000 update PROMs on eBay, as well as update PROMS for the Matrix-6 and 6R – if they are gone, just follow one of the links below – there are order forms at the end of those pages. 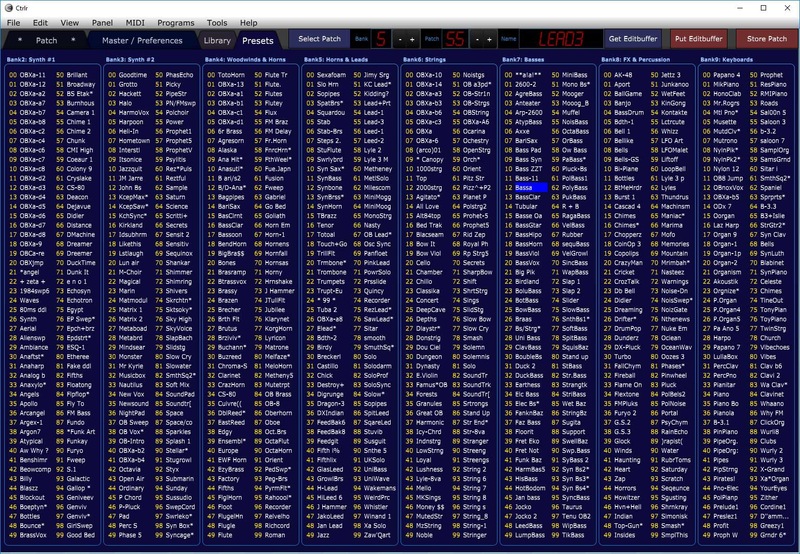 Enter the Matrix – finally the R/W decoder is legible. Looking to get the latest revision of Bob Grieb’s firmware rewrite mentioned below? Click here. It told the synth to discard all parameter edits except the most recent one, thereby keeping the synth responsive. 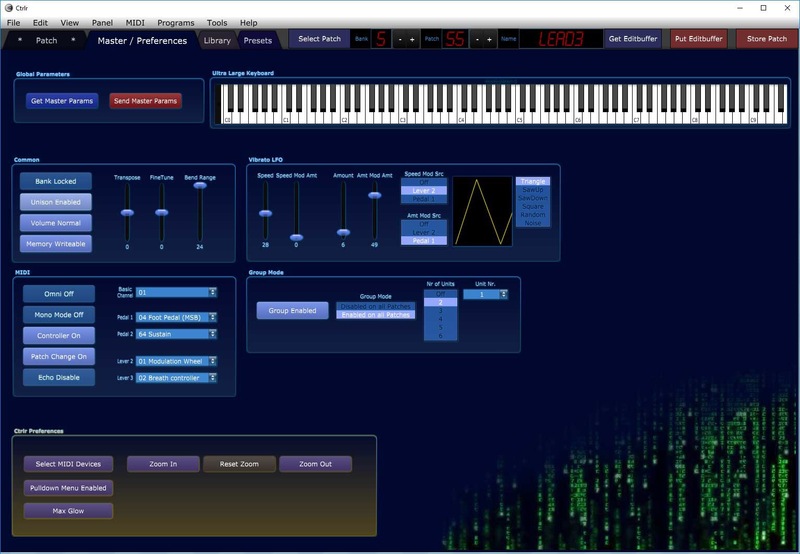 This is a huge improvement and makes the Matrix feel and behave almost like a modern instrument. But it gets even better. This stack contains pointers to code, ptrs to variables, and some pre-computed values. Only pointers to the code needed to handle the enabled features are placed on the stack… This is a very fast and efficient way to update the voice cv’s. A downside of this approach is that when parameters change, the stacks need to be updated for all six voices. Some parameter changes just affect one number on the stack, so that number can simply be changed very quickly. But some parameters can change the size of the stack. This is a problem, as the update values for that parameter may be in the middle of the stack. GliGli’s main trick is to tell the machine to discard anything but the last Sysex command. He also noticed that sometimes the stack is rebuilt although this is not technically necessary. And this is the road that Bob has been following. 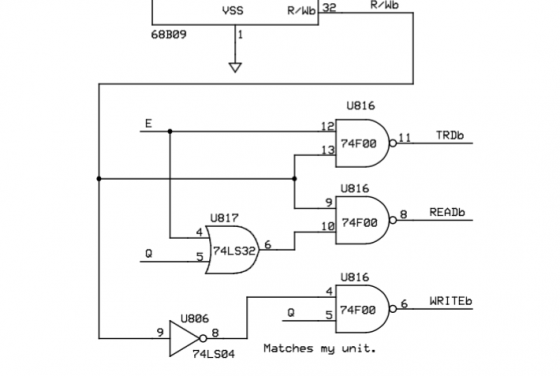 He rewrote parts of the firmware to handle a set of about a third of the parameters much, much faster – including VCF frequency and resonance, DCO PW and LFO control, and VCA level. 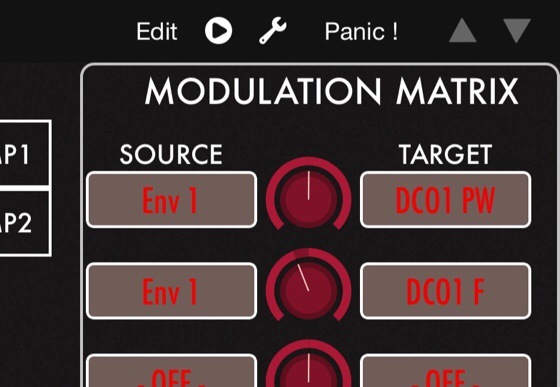 Changing these parameters with an external controller will be smoother than with older firmware, others – increasing the effect of a modulator in the mod matrix – will still cause the machine to glitch. Update, 2016: Now that you’ve made it this far, you’ll be glad to learn that Bob made his revised code available for Matrix-1000s and Matrix 6/Rs. 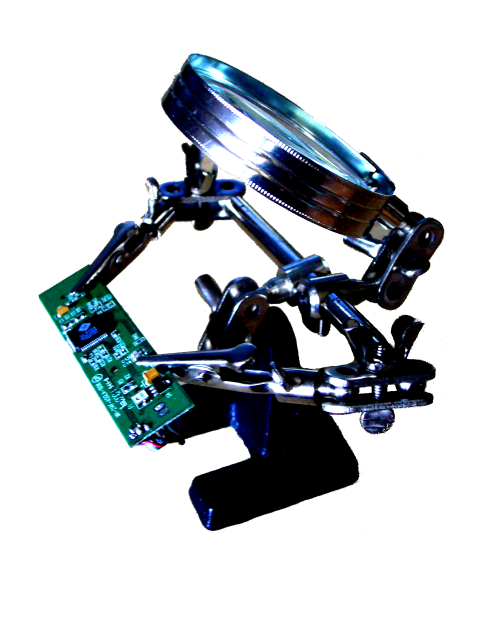 You can get a firmware EPROM from him or, if you are in Europe, from me – just follow the links above. 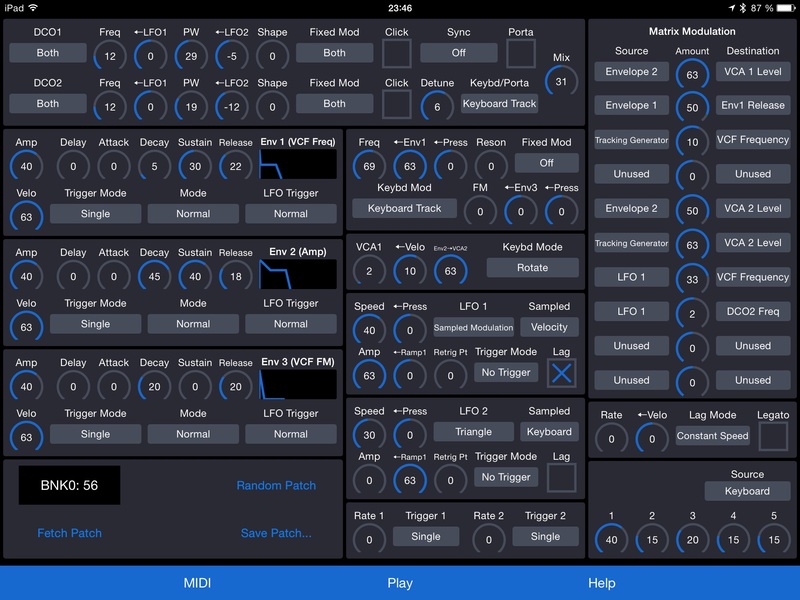 There is a true Oberheim Matrix editor for iPad now. And yes, it’s worth buying it. 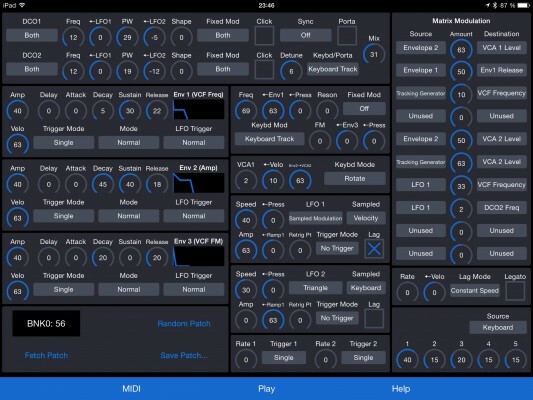 If you have found this blog searching for the Oberheim Matrix-6/1000 synthesizer, you may already know that I still haven’t given up on breathing new life into hardware and software of this wonderful machine, and that I have made a controller template for the iPad. 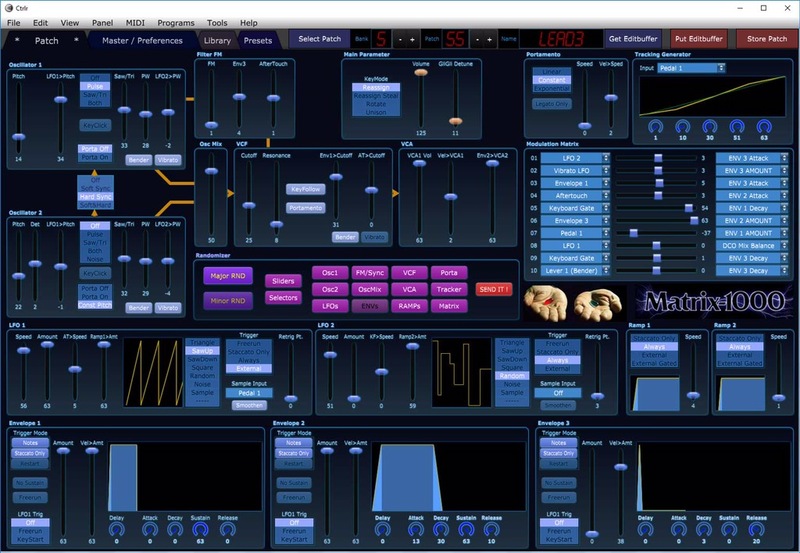 A controller, mind you, not a true editor – but a tool to control each parameter in a sound preset via a dedicated touch control, and pretty much without alternative. No longer – there is a true Matrix editor app in the Store now, Patch Touch by Coffeeshopped, LLC. How does it compare? Is it worth the 15 30 Dollars or Euros? Chadwick, the guy behind Coffeeshopped, was so kind as to send me a download code for his app, and to comment on an early draft of my observations, so you’ll find my remarks updated with his comments here. 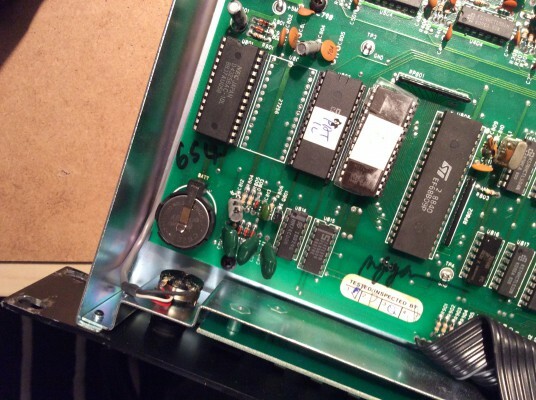 Update: Looking for the new, rewritten firmware? Info on how to get the latest version here. There is some (potentially) very good news for Matrix-6/6R owners hoping to get a firmware update – it has come a huge step closer. An extremely experienced engineer has just decided to put his annotated source code file for the Matrix-6 online – you will find it on his page at Oberheim Matrix 6 Firmware. 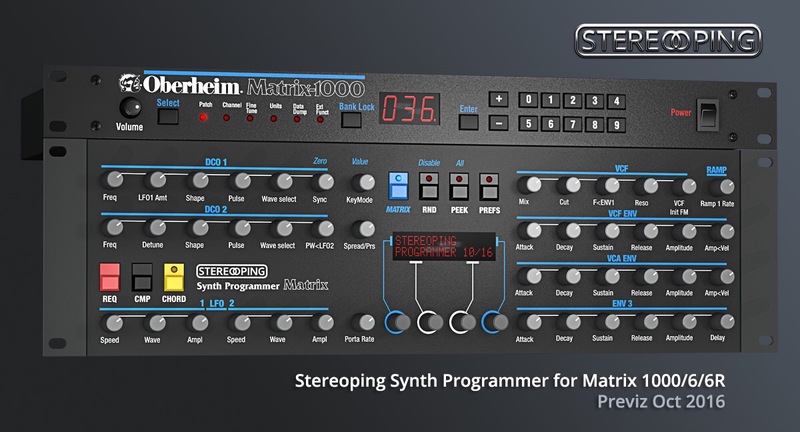 Not the original sources from Oberheim, mind you – they are rumoured to have been lost when someone accidentally dropped the master source disk – but a very carefully annotated listing, reverse-engineered. The engineer who did this even spent the time to mark code that has been re-used in the Matrix-1000 firmware. So what does that mean to you as a (potential) M6 owner? 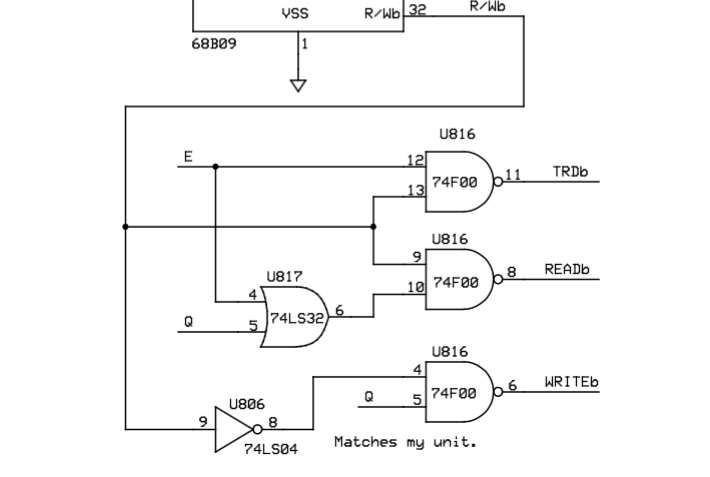 If you do not know a thing about coding for a 6809 CPU, possibly nothing. You’ll have to wait. 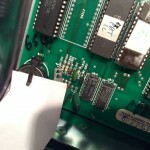 But if you are into hacking and tinkering with old 8-bit machinery, it makes understanding the code a whole lot easier – and should also make it possible to backport GliGli’s patches into the M6 firmware, comparing his Matrix-1000 V1.16 code with the original V1.13 code and looking at the changes. The engineer has decided to abandon the project – he thinks that the performance problems of the Matrixes are a result of fundamental design decisions and would need too much effort to get around properly. But his code definitely improves the chances of doing something useful for the code. Someone with skill and spare time might even backport the M1000’s NRPN and matrix modulation Sysex commands into the M6 code. 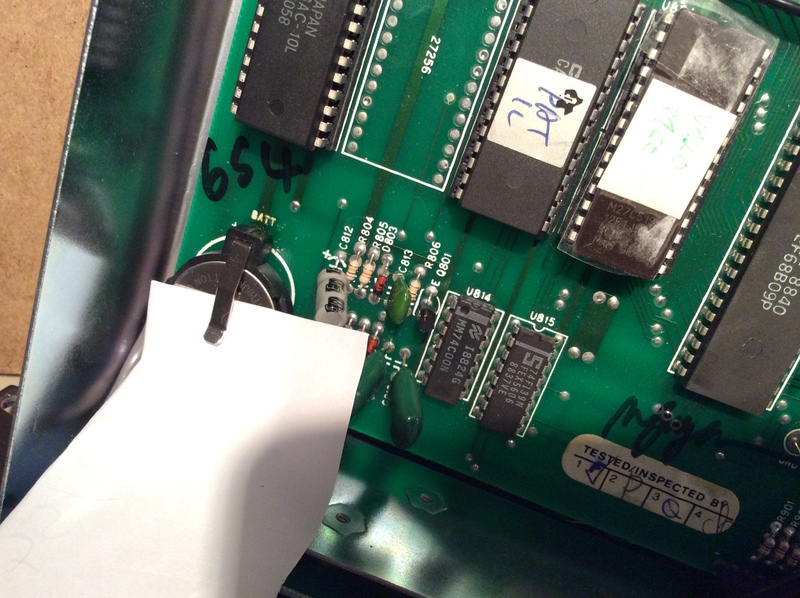 BTW: My attempts at starting a documented source code file for the Matrix-1000 can be found here, with a hardware and software primer here. If I can find the time, I’ll try to backport a few of Bob’s insights into the M-1000 code.